Tranquil Master Bathroom in Pasadena "AFTER"
This 1970’s master bathroom was not inviting to the current home owners. It had a nice footprint and lots of potential. We decided to remove everything, including the framed window and sunk-in tub, as well as the small, walled-in shower, double vanity and flooring. The locations of these components remained the same. To make the most of the fantastic view, we agreed that the corner window needed to be frameless, creating a relaxing vista from the new soaking tub. The wall between the tub and shower is designed with a half glass panel above the marble half-wall. This allows daylight into the shower and the occupant of the shower to enjoy the view. 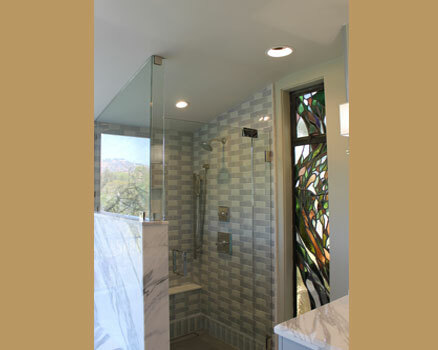 The existing stain glass window and panel adds color to the tranquil palette. Our vision was to create an elegant space that is functional. A light grey palette was chosen to achieve this feeling. We selected Calcutta marble slabs because of the beautiful grey and beige veins contrasted by the clean white marble. The slabs were fabricated for the tub surround, the half wall between the tub and shower, and the vanity countertop. The baseboards were fabricated from the Calcutta slabs. We shopped several tile showrooms and selected the 2” x 4” tile at Ann Sack’s using 3 shades: ice grey, twilight and pewter. These gloss tiles create the border for the grey porcelain floor tile, the vanity back splash as well as the shower walls. Storage is a necessary function, but it can be attractive. Two new tall cabinets were planned in addition to the existing vanity and one recessed wall cabinet. They have a contemporary, grey paint door design with decorative knobs as the “jewelry” accent. A sparkle is added throughout the space with polished nickel wall sconces, mirrors and faucets. New dimmable LED recessed lights were added to the ceiling. If you are relaxing in the deep tub, they can be set at low; but can be adjusted higher for tasks such as applying make-up. The home owners are very pleased with the master bathroom and love the dramatic change, especially the inviting tub and shower; as well as the additional storage.